Dr. Caplan is part of a large family of Houston physicians. 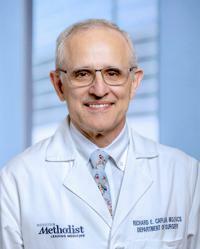 Starting practice in 1985, he has spent his entire career in the Texas Medical Center, basing his practice for over two decades at Houston Methodist Hospital. He practices a wide spectrum of general surgery including endocrine surgery, surgical oncology, hernia and complex abdominal wall problems, laparoscopic and robotic surgery. In addition to his clinical practice, Dr. Caplan is a staunch advocate of continuing medical education and global health. He has received 6 teaching awards including being a two time winner of The Golden Apple Faculty Teaching Award. Dr. Caplan was also the 2010-2011 President of the Houston Surgical Society. Focusing on his interest in capacity building in global surgery, Dr. Caplan is involved in the first American College of Surgeons pilot to improve the training of surgeons in Ethiopia. He has also made 7 mission trips to Haiti and has worked with Faith in Practice in Guatemala. He serves on the Houston Global Heath Collaborative board, a group which aims to support collaboration, education and research among the member institutions of the TMC. Dr. Caplan is an effective, caring communicator and works in a collaborative style to make his patients feel comfortable with their surgical experience.